Highlights from Wednesday night's McKenna Cup semi-finals with Cavan edging out Fermanagh while Tyrone cruise to victory over Armagh. Cavan clinched a 1-8 to 1-7 win at Breffni Park while the Red Hands remained on course for a fourth successive McKenna success by beating the Orchard side 3-10 to 1-8 at the Athletic Grounds. 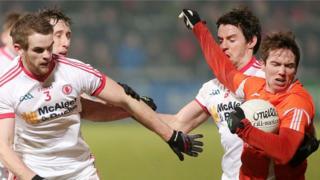 Tyrone manager Mickey Harte and Cavan boss Terry Hyland gave their views on the semi-final action.